February 13, 2016 By This post may contain affiliate links. 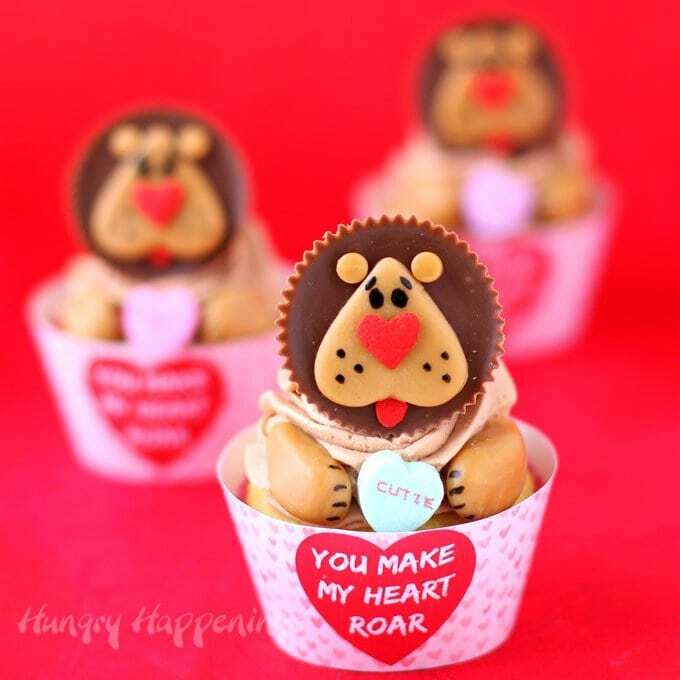 Turn Reese’s Cups into adorably cute lions using caramel and heart sprinkles then use them to make Lion Cupcakes with “You Make My Heart Roar” Cupcake Wrappers for Valentine’s Day. I know Valentine’s Day is tomorrow and you wish I would have shared these crazy cute cupcakes with you sooner. Sometimes ideas come to me at the last minute and I rush to get them done, because I just don’t want to wait an entire year before being able to post them. These lion cupcakes couldn’t wait. Ever since I made my Teddy Bear Cupcakes using Reese’s Cups earlier this month, I’ve been thinking of other Valentine’s Day cupcake ideas using the same technique. I sat one afternoon and stared at a peanut butter cup for a while, looking for inspiration and noticed that the jagged edges looked a bit like a lion’s mane. So, I grabbed candies and cookies and sprinkles and spent an hour trying to turn the chocolate into a lion. All of the lions looked cute, but I just wasn’t wild about any of them, so I took to the web and found some adorable lion cookies, created by Jill on Flicker. Her heart shaped lion’s face was exactly what I was looking for. I used her basic idea, but created my lion’s heads using Reese’s Cups and caramel and added them to a big swirl of frosting on top of a cupcake. Each of these Valentine’s Day cupcakes are wrapped in a custom designed printable wrapper. I created these using a digital cupcake wrapper template that was designed by Cindy at Skip to My Lou. Click on the link below and you can print these wrappers onto card stock. Then cut them out to decorate your own cupcakes. 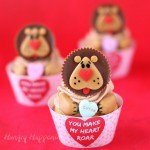 If you want to serve these lion cupcakes at a zoo themed party, you can use Cindy’s template to create your own printable cupcake wrappers. To make the lions, start by unwrapping the caramels and placing them in the microwave. Heat them on the defrost setting for 5 second increments, removing and kneading after each, until soft and pliable. Flatten out the caramel and cut out a heart shaped face and two small round ears. I used a small round plunger cutter to cut the ears, but you can simply pitch off pieces and roll them into balls if you don’t have a plunger cutter. 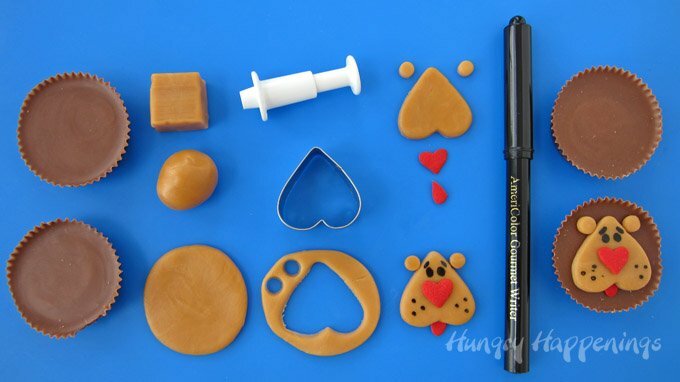 Press a large red heart sprinkle onto the caramel heart to create the lion’s nose. Break another red heart into two pieces and press one with the rounded edge sticking out under the curve of the heart to create a tongue. Use a black food coloring marker to draw eyes, eyebrows, and freckles onto each heart. 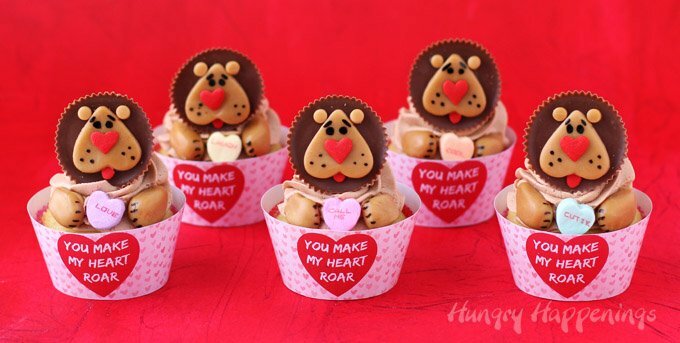 Attach the caramel heart (lion’s face) and ears to a chocolate peanut butter cup using melted light cocoa candy melts. 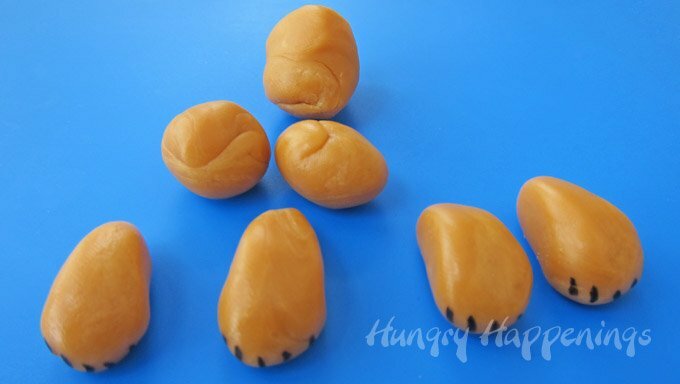 Create the lion’s paws using more caramel. You’ll need 1 caramel square to make one set of paws. Cut the caramel in half, roll each half into a ball then into a tear drop shape. Draw 5 claws onto each paw using a black food coloring marker. 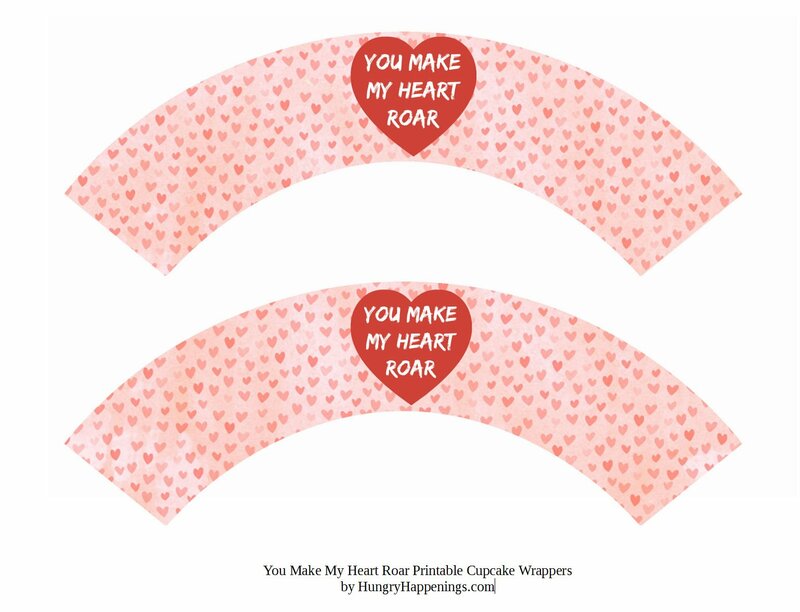 Print out enough “You Make My Heart Roar” cupcake wrappers to wrap around all your cupcakes. Cut them out and wrap them around the cupcake, taping the edges together. Add a swirl of frosting on each cupcake then attach one lion on the front of the top part of the swirl. You can use peanut butter frosting, caramel frosting, or just color white frosting tan to match the caramel lion’s face. Add one conversation heart to the front of the cupcake and place one paw on either side of the candy. I wanted to share a recipe for the frosting that I used, but I started by making dulce de leche frosting, which was too soft. I played with the recipe for a long time, adding more powdered sugar, then adding melted peanut butter chips and peanut butter, and it never got to a point where I could pipe a big swirl on top of my cupcakes. It tasted great, but just didn’t work. I was running out of time, so I grabbed a tub of Wilton White Frosting, added some peanut butter to it, and colored it using some brown and yellow food coloring. It worked perfectly and tasted really nice. If you have a favorite recipe for peanut butter or caramel frosting that pipes well, I’d love it if you’d share it with me, so the next time I will have the perfect topping to my cupcakes. Top cupcakes with a big swirl of frosting then add a Reese's Cup Lion and decorate them with a "You Make My Heart Roar" cupcake wrapper. Unwrap caramels and soften them by heating in the microwave on defrost for 5 second increments, kneading after each, until soft. Flatten 6 of the caramels, and cut using a 1 - 1 1/2 inch heart cutter. Cut 12 small circles using a small round plunger cutter or pinch off pieces and roll into small balls. Press one red heart sprinkle onto each caramel heart forming the lion's nose. Break the remaining 3 heart sprinkles in half. Attach one piece with the rounded side facing down, under the curved part of the caramel heart, creating the lion's tongue. Draw eyes, eyebrows, and freckles onto each caramel heart using a black food coloring marker. Attach one caramel heart lion's face and two caramel ears to each peanut butter cup using melted confectionery coating. Cut the remaining caramel squares in half. Roll each into a ball then into a teardrop shaped paw. 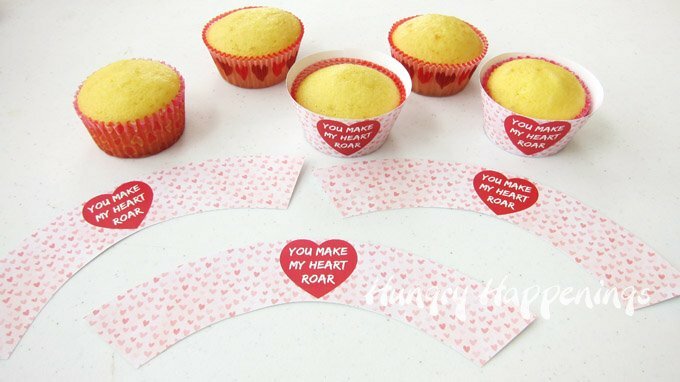 Wrap each cupcake in a printable "You Make My Heart Roar" cupcake wrapper. Spoon frosting into a large pastry bag fitted with a large 1M star tip. Pipe a big swirl of frosting on top of each cupcake. Press a Reese's Cup lion onto the front at the top of each frosting swirl. Press a conversation heart onto the frosting just below the lion's head. Attach one paw on either side of the candy heart. 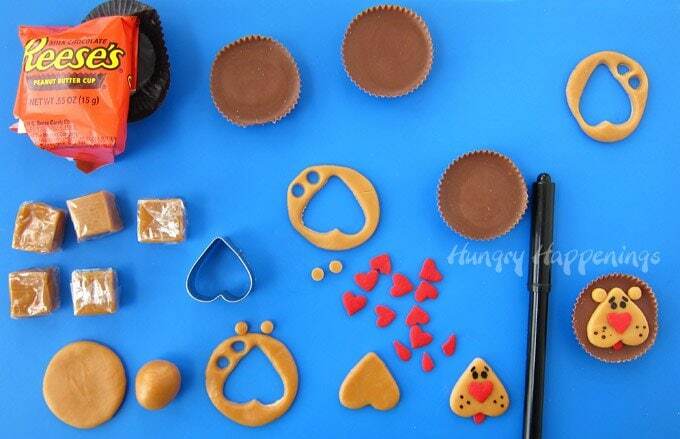 You always come up with the cutest ways to use Reese’s and those wrappers…just so fun! I thought the wrappers really tied the whole treat together. I’m happy you like them. Thanks! This is absolutely adorable! Happy Valentines Day! I tried making your teddy bear cupcakes, but couldn’t get the head to stand upright on the cupcake – it kept wanting to fall backwards. I had a big swirl of frosting on the top of the cupcake. I was wondering how you got yours to stay upright? Sorry to hear you had trouble. I made sure there was enough frosting behind the peanut butter cup to hold it up, so I attached it low enough on the big swirl so that it would hold it up. So, be sure to press it into the frosting swirl so that you have enough frosting behind the peanut butter cup. If your frosting is really soft, you might need to add a bit more frosting behind the peanut butter cup. When I made the monkey cupcakes, I inserted a sandwich pick in the side of the Reeces, starting the hole with a regular tooth pick, then inserted into the cupcake,, worked great as I was transporting them 1 1/2 hours away. Hope this helps! Thanks for sharing your tip! I have started using Pocci cookie sticks to hold up the Reese’s Cups which works great too! Love the printer friendly option. I’m so glad to hear that. Thanks! 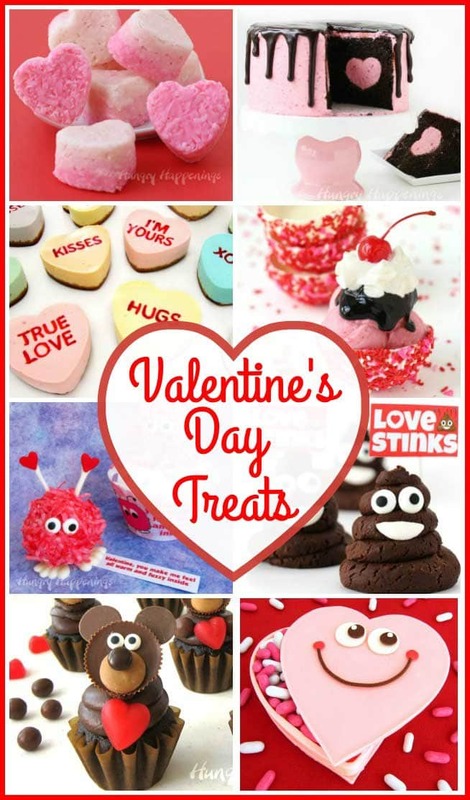 Once again, you have made the most adorable Valentine cupcake toppers! Can you tell us what/where to find the heart sprinkle you used? Thank you again for sharing your creativity!